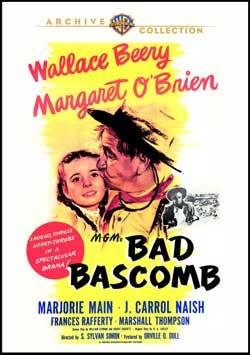 Bad Bascomb – An outlaws heart is stolen by a cute little moppet in this captivating Western adventure starring Wallace Beery, Margaret OBrien, Marjorie Main and J. Carroll Naish. When Lawmen foil his gangs latest heist, Zeb Bascomb (Beery) escapes by taking refuge in a Mormon caravan, posing as its newest convert. Assigned to work for Abbey Hanks (Main) and bonding with her granddaughter Emmy (OBrien), Zeb plans to run off with the wagon trains gold, until the head elder appoints him their leader. Caught between the threat of an Indian attack and capture by the law, Zeb cant quite decide whose neck to save, Emmys or his own. Starring: Wallace Beery, Margaret O’Brien, Marjorie Main, J. Carrol Naish, Frances Rafferty, Marshall Thompson, Russell Simpson, Warner Anderson, Donald Curtis, Connie Gilchrist, Sara Haden, Renie Riano, Jane Green, Henry O’Neill, Frank Darien. 1946 – BW – 110 Minutes.